Gas Type: Propane, Ignition Type: Battery-operated pulse ignition, Weight: 90 lbs. 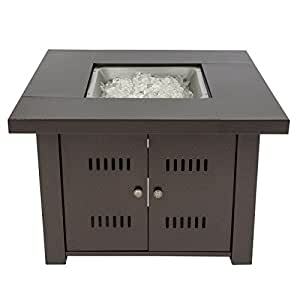 This is Antique Bronze Fire Pit which solid-steel-constructed fire pit table is incredibly durable and has a bronze finish, giving it a rustic appearance. Clear, chunky fire glass covers the burner to add a touch of elegance. An easy-access door located at the base allows you to conceal a 20-lb. propane tank (not included). This fire pit includes a cover for protection when not in use.